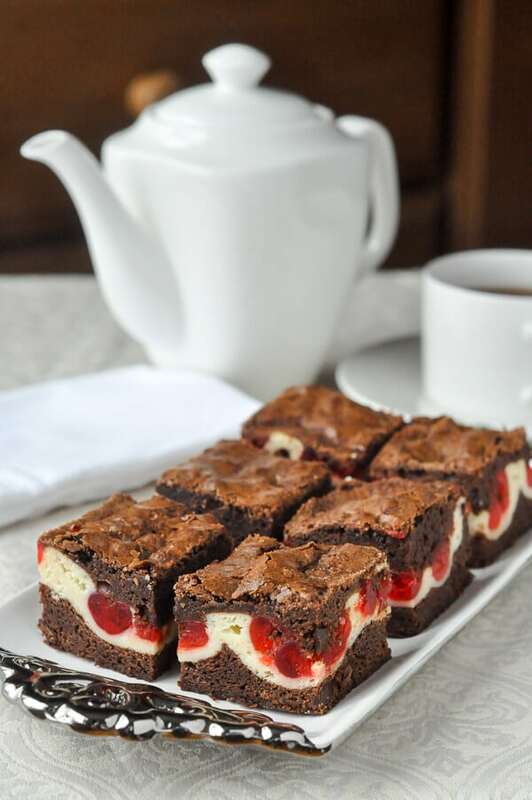 Cherry Cheesecake Brownies - two tempting favourites in one! 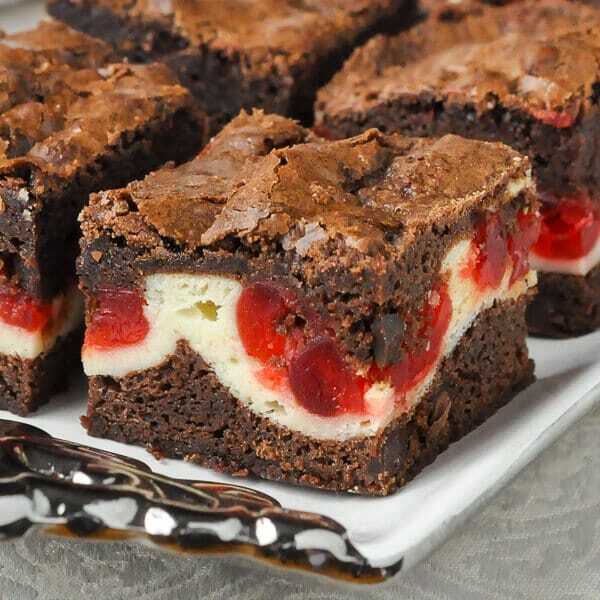 Cherry Cheesecake Brownies. 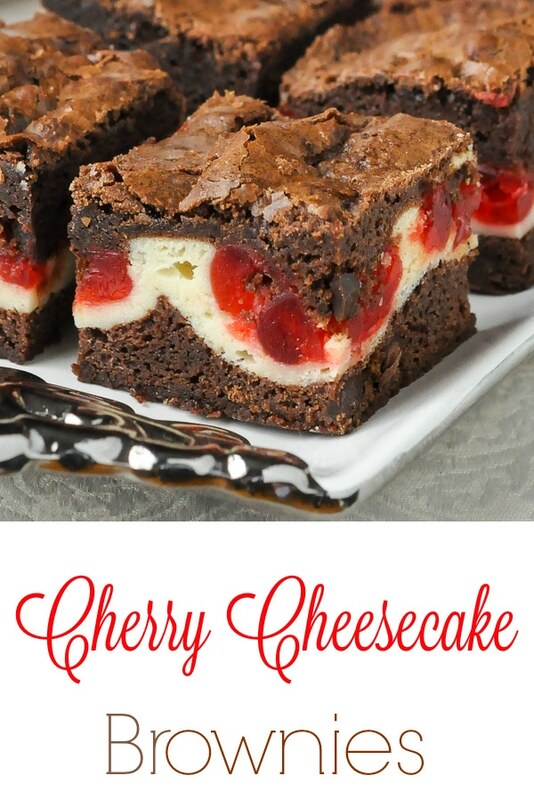 An outstanding soft chewy brownie with a cheesecake centre that gets sweet glacé cherries baked into it. Another great freezer friendly cookie bar recipe. I hadn’t made these cherry cheesecake brownies in a few years but I found them listed on an old “recipes to do” list just a couple of weeks ago. I have a box of old exercise books, spiral bound planners and just scraps of paper that I’ve scribbled down ideas and notes for recipes over the years. My mind always invents things that I don’t have time to do but I always say I’ll get back to. In this case I did. My note said to make the recipe “more chocolate-y” and thats exactly what I did. I modified the original brownie recipe while still keeping it simple and I also made the cheesecake centre a bit thicker. I’ve seen these in some local bakeries and always thought that the centre was too thin. The white of the cheesecake contrasts so well with the dark brownie and the red pops right out for a very festive look at this time of year, so I wanted to make the most of that too. Red Glacé Cherries are used in this recipe but you could use well drained maraschino cherries instead. I also added chocolate chips to the cherry cheesecake brownies recipe which really upped the chocolate factor in the brownie. I use 50% cocoa chocolate chips almost exclusively in my baking, so that, and using good quality cocoa really will satisfy any chocolate craving. I served this renovated recipe up to a my mom and sisters at lunch recently and they were a huge hit. This recipe was such a success, I might just turn it into a trend of “make this better” recipes in 2017! Like this Cherry Cheesecake Brownies recipe? 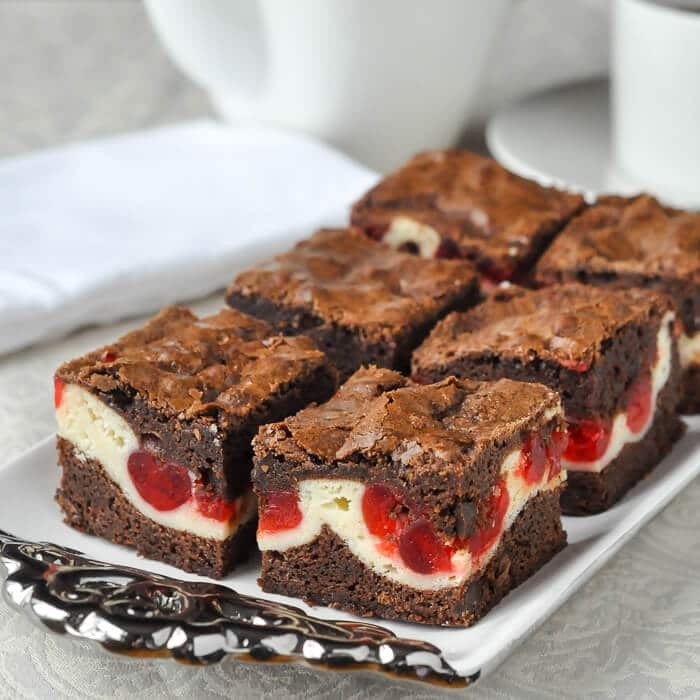 Cherry Cheesecake Brownies - an outstanding soft chewy brownie with a cheesecake centre that gets sweet glacé cherries baked into it. Another great freezer friendly cookie bar recipe. Cream together the sugar, vanilla and cream cheese. Beat in the egg, then add the flour and mix until smooth. Fold in the glacé cherries and set the mixture aside while you prepare the brownie batter. Preheat oven to 350 degrees Lightly grease a 9x13 baking pan and line with parchment paper. Sift together the flour, cocoa and baking soda. Set aside. Melt the butter and mix together with the brown sugar, white sugar and vanilla in an electric mixer on low speed. When combined add the eggs all at once. Note: at this stage you want the sugars to dissolve as completely as possible into the eggs butter and vanilla. I use my stand mixer on the lowest setting and leave it for 10 minutes or longer until no sugar crystals remain in the mixture. To test for this you can spoon a little of the mixture from the bottom of the bowl onto your thumb and then rub together your thumb and forefinger. You shouldn't be able to feel any grains in the sugary syrup mixture. Fold in the sifted dry ingredients and then the chocolate chips until the batter is smooth. Don't overmix the batter; I prefer to do this sep by hand. Pour about 1/2 or a little more of this batter into the prepared pan. Begin to carefully spoon the cheesecake mixture over the brownie batter. Take your time and spoon it on gently, a tablespoon at a time. I use an offset spatula to smooth it at the end but this is not completely necessary. Spoon the rest of the brownie batter on top of the cheesecake batter in the same careful manner and smooth the top with an offset spatula or the back of the spoon. Bake for 45-50 minutes or until the top is well crackled and dry looking and the brownies are starting to shrink back from the sides of the pan. A toothpick inserted into the centre can still have a few wet crumbs left on it when withdrawn but not gooey in the centre. These are pretty thick cookie bars so they may take a little longer in your oven, depending upon the pans you use. I use all aluminum bakeware and they took the full 50 minutes. Cool completely before cutting into cookie bars. Store in an airtight container. Freezes quite well too. Previous Post: « No Bake Christmas Cookies – easy & freezer friendly! These brownies look so good. I saw that you said you made a few additions to the recipe. Is the recipe that is printed above with your changes? If not would you tell us what and how much the changes are. Thanks, I want to make these for some gifts. Thanks a lot!! The changes are already incorporated into the recipe. 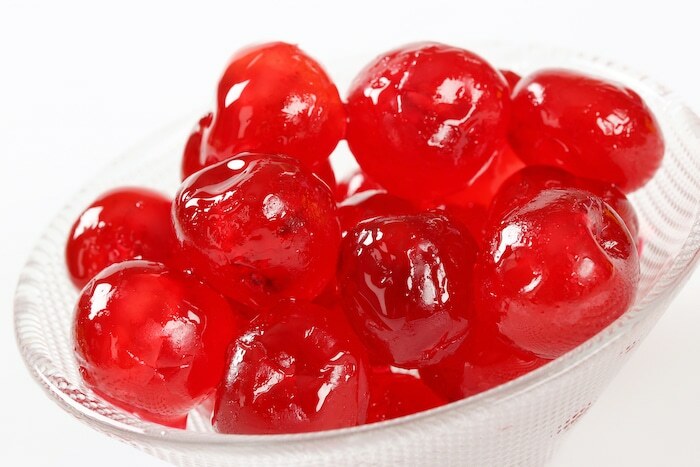 Is it possible to substitute maraschino cherries as I dislike glase cherries? These look yummy. Would it be a problem if I reduced the sugars in the brownie by half? Yes, brownies get their texture from the amount of sugar in them. You’ll likely get something like cake.